For emergencies call (501) 225-1577. We make the commitment to provide high-quality and comfortable emergency dentistry care for our patients. Even if you’ve never been to a Central Dental office before, we will do our best to see you the same day as your emergency to evaluate your condition. You can also read more about how we treat Orthodontic Emergencies and TMJ Emergencies and some immediate actions you can take to help ease your discomfort. Regular dental care helps prevent inconvenient dental emergencies, however, dental emergencies can and do occur. Listed here are some of the more common dental emergencies and what you can do until you can be evaluated by a Central Dental emergency on-call dentist. Our doctors are here for you, 24-7 to help ease your pain and provide the best comfort possible for our patients. Make an appointment as soon as possible if you are in pain. If you call after hours, we have a live operator on call at all hours that will help us address your situation and make an appointment with our emergency on-call dentist. Avoid touching the root of the tooth and rinse it gently with water to remove dirt. Do not scrub the tooth or remove any tissue that may still be attached. If you can, put the clean tooth back into the socket from where it came to keep it moist. This helps maintain the vitality of the tooth. If your mouth is injured, bloody, or too painful to put the tooth back in its place, wrap it in clean gauze or cloth that has been soaked with either saliva from your mouth or milk. You may also place it in a cup of milk or if milk is not available, place the tooth in a cup of water with a pinch of salt. The goal is to prevent the tooth from drying out. Chipped or Broken Tooth- Teeth with large fillings can easily break or fracture. Call us as soon as possible to have the tooth evaluated and restored. If the broken tooth is not treated, more serious problems can develop. Broken teeth may or may not be sensitive to air and temperature changes. Sensitivity and pain are not necessarily an indication of how badly the tooth is damaged. Tooth Knocked Out – If you have a knocked out tooth call us immediately for urgent dental care because there is a short window of time in which teeth can be successfully replanted. The chances of successfully saving a tooth are much higher when the tooth can be returned to the socket within one hour after the injury. One of our skillful doctors or compassionate staff will return your call to make appropriate arrangements for your care. Dislocated Jaw or Locked Jaw – A dislocated or locked jaw can cause significant pain and anxiety. Do not try to force the jaw back into the proper position, pry it open or force it shut in an attempt to fix the problem yourself. Relocating the jaw to the appropriate position and unlocking the jaw should only be performed by a highly trained and experienced professional. The doctors and staff at Central Dental treat these situations regularly and are well versed in the course of care necessary to alleviate your pain, move your jaw back to the correct position and provide stabilization as healing occurs. If you are in need of a TMJ dentist or doctor for a jaw injury, call Central Dental immediately. A qualified doctor, or caring member of our staff, will return your call to coordinate your care. Severe Toothache/Sensitive Teeth – You may be experiencing pain in your tooth for a variety of reasons, including a cracked tooth, abscess, untreated decay or cavities, broken or lost fillings, broken or lost crowns, impacted wisdom teeth, and acute sinusitis. No matter the cause you need to see a Central Dental dentist as soon as possible for evaluation. Over the counter pain relief medication can temporarily relieve the pain; however, you should never put it directly on the gum tissue or tooth. Slight pain, if left untreated, can progress into facial or oral swelling and severe pain. The dentists at Central Dental can often eliminate tooth pain with endodontic treatment, or root canal therapy. People have often heard frightening stories about root canal treatment, but with modern techniques, it can be relatively painless. Object Stuck Between Teeth – If you cannot gently & easily remove the object with dental floss, give our office a call to that we may assist you. Do not use pointed or sharp items to force the object from between your teeth as this may cause additional damage to the teeth. Bitten or Cut Cheek, Lip or Tongue – Apply gentle, yet firm pressure, to the area with a clean cloth, dampened tea bag or sterile gauze, if available. Tea bags offer added benefit as the tannic acid helps to constrict blood vessels or lessen bleeding. Ice may be applied to any bruised or swollen areas. Try to avoid excessive physical activity, raised tempers, and sitting upright as they all increase blood flow to the head. If bleeding does not stop after 15 to 30 minutes of pressure call our office immediately or seek further assistance from your local emergency room. Swollen Gums – Swollen gum tissue is often a sign of infection which could be caused by nerve dying within the tooth or periodontal (gum) disease. You may or may not experience pain with the swelling. Either way, it needs attention relatively quickly. Our doctors will make sure that you are at ease before and after your cosmetic procedure. Complications after dental procedures are rare but do occur unexpectedly at times. Listed here are some problems that could arise after common procedures and what you can do until you can be examined by your Central Dental dentist. Bite Feels “Off” – It usually takes a few days for you to become accustomed to changes in your bite or position of your teeth; however, if this feeling persists for more than a week give our team a call and we’ll reserve a simple adjustment appointment for you. Pressure or Temperature Sensitivity – It’s expected that you may have some hot and/or cold sensitivity while you are getting adjusted to the changes in the natural tooth structure and the new materials to restore it. This is completely normal. Gum Soreness – Tenderness of the periodontal tissue, or gums, is another normal response of the body in relation to recent cosmetic procedures. Rinsing your mouth with warm salt water (approximately 1 teaspoon of salt in a cup of water) will help reduce the swelling and ease any discomfort. Rinse, swish, spit! Difficulty Speaking – You may speak with a lisp or sound a little muffled after the initial completion of your cosmetic dentistry. Your body will naturally adapt to the changes and the issue should resolve within approximately a week. Increased Salivation – An increase in the amount of “spit” your body produces shortly after cosmetic procedures is a natural reaction to leaving something “foreign” in the body. As your body becomes used to the changes this should resolve. Numbness after Appointment – Your teeth, lips, and tongue may remain numb for several hours after your appointment depending upon the amount of anesthetic used. You will need to avoid eating or chewing until full feeling has been regained; failure to do so may result in unnecessary trauma to the cheeks and tongue. Temporary or Provisional Crown Issues – Occasionally a temporary crown will become loose, break, or fall off altogether. If this happens, protect the temporary in a safe place (not your pocket) until we can bond it back in place for you. We’ll likely see you on the same day if this occurs during business hours. Eating after Fillings – White fillings set completely at the time of your appointment, so you should be able to eat immediately after feeling returns to the area. On the other hand, if you came in for amalgam (silver colored) fillings, you should not chew directly on the fillings for 24 hours. We suggest you chew on the opposite side of your mouth. Bite Feels “Off” – It usually takes a few days for you to become accustomed to changes in your bite or position of your teeth; however, if the feeling persists for more than a week give our team a call and we’ll reserve a simple adjustment appointment for you. Temporary Filling Wearing Away or Breaking – A temporary filling or crown is often used to protect the tooth between root canal therapy appointments. It is not uncommon, or cause for concern, if small pieces of the temporary filling break or wear away. Give us a call if it the temporary filling or crown falls off entirely so we may place it back on the tooth. Discomfort – You may be slightly uncomfortable the first several days after your root canal therapy, especially while chewing. Rinsing your mouth with warm salt water (approximately 1 teaspoon of salt in a cup of water) will help reduce the swelling and ease any discomfort. If pain medication was prescribed, you should take it as directed to keep the discomfort manageable. You must take antibiotics, if prescribed, in their entirety even if you are feeling better. We will need to see you in the event that pain is unmanageable or swelling persists longer than the first several days. Bleeding – It is expected that there will be some bleeding after the extraction of a tooth. Your saliva will likely have a pink tint. It’s important that the bleeding is controlled so healing can begin. If bleeding becomes excessive, more than a slow ooze, you may need to continue to bite down on dampened gauze pads to control it. It is recommended you replace gauze every 30 minutes. You may use moistened tea bags if you run out of gauze as it contains tannic acid which helps promote clotting. Try to avoid excessive physical activity, raised tempers and sitting upright as they all increase blood flow to the head. Give our office a call if your bleeding has not reduced after 48 hours. Dry Socket/Throbbing or Increasing Pain – Pain generally subsides after an extraction; however, on rare occasions, a dry socket may develop and pain will increase. Many patients describe this pain as a throbbing pain that radiates towards the ears. A dry socket develops when the blood clot becomes dislodged before healing is complete. A dry socket is not an infection, but it still requires your doctor’s attention. Give our office a call if you think you may have a dry socket. Gently rinse your mouth after eating and drinking to remove food debris for the first 48 hours. Do not swish! Brush and floss the teeth adjacent to the extraction site as you normally would. A clean mouth heals faster! Limit yourself to calm activities and avoid physical excessive physical activity. Eat only soft and nutritious foods for the first 24 hours; you may resume your normal diet thereafter or whenever you are comfortable enough to do so. No hot or spicy foods! 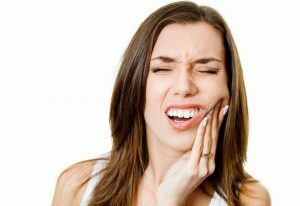 Persistent Pain/Swelling – It is normal to experience some pain and swelling after having a tooth extracted. You may apply ice to the outer cheek area surrounding the extraction site to keep swelling to a minimum. It’s recommended you use the ice in 15-minute intervals throughout the first 36 hours; after that moist heat may be used. Swelling usually completely subsides within ten days after the procedure. Use any prescribed pain medication as directed to keep the discomfort manageable. Take any antibiotics prescribed in their entirety even if you feel that it is no longer needed. If you have unbearable pain or severe swelling after two to three days give our office a call so we can schedule a time for your dentist to evaluate your condition. Bone Fragments/Tooth Fragments – Small, pointed fragments of tooth or bone may slowly erupt through your gum tissue during the healing process. These are simply fragments that were too small to be removed during surgery. You may experience some tenderness during this process, so feel free to give us a call if you notice any pieces of a tooth like structure protruding from the extraction site. Numbness – You may experience numbness around the extraction site for up to 10 to 12 hours after your procedure. If numbness persists longer you’ll need to be evaluated by your doctor at Central Dental. Difficulty Opening and/or Closing the Mouth – Sometimes the muscles and jaw become sore after extractions. This soreness may last for about three to five days after the procedure. If the soreness does not subside you should schedule a TMJ consultation with the experienced professionals at Central Dental for further evaluation. It is important that you see us as soon as possible if you are having any of these dental issues. We have live operators who answer our phone lines after-hours and who are able contact our doctors or staff in the event of an emergency. During normal business hours, we reserve time on our schedule in order to treat emergencies, but we need to know about them before you come into our office so we can prioritize our patients’ needs.